There’s a good chance you’ve never heard of Chapter2. Michael Pryde founded the company in 2017 after two years of design and development work. But does the Pryde name sound familiar? NeilPryde bikes were used by the UnitedHealthcare team in 2013 and 2014, ridden to numerous wins in those seasons. Michael designed the bikes for his father’s company, NeilPryde, where he worked for seven years. Then, son left dad’s company to pursue his own ambitions. Chapter2 was born. Chapter2 opened its doors for business in July 2017 with a frameset, the Tere. Its New Zealand roots (“Designed in New Zealand” proudly adorns the lower seat tube) lend inspiration for the Maori name, Tere, meaning “be quick, swift, and fast.” The Tere is a modern take on a traditional road frame design, and is available in either rim- or disc-brake versions. Michael’s background both as an architect and as designer at NeilPryde, which pioneered the use of composites in windsurfing well before the cycling industry caught on to the benefits of carbon fiber, have influenced both his sense of craft and aesthetic. The two aspects of that philosophy come to life in the Chapter2 Tere. The monocoque blow-molded frame is made from pre-impregnated Toray carbon. In collaboration with the University of Auckland, Pryde attempted to optimize tube design for a more aerodynamic shape. The result is a subtly ovalized seat stay and truncated Kamm-tail shapes on the head tube, seat tube, and seat post. The Tere is an example of the current blending of bike categories: mostly a traditional race bike design, some aerodynamic touches, even some endurance touches — or shall we call them compliance touches? — such as dropped seat stays and a flattened seat post. Do those various attributes lead to compromises? Or does it lead, instead, to the best of what the bike industry has to offer rolled into one bike? Mostly the latter. The resulting ride is one that is simultaneously smooth and sharp: comfortable for the variable roads of the world, and which confidently and deftly tracks through corners with aplomb. Race bike? Could be, most definitely. Modern touches that take it beyond such categorization? Absolutely. In the grand world of bike design, wheels and tires mean as much if not more for a bike’s comfort than the frame. The Foil Legend Series wheels and Vittoria Corsa 25 tires our test bike came equipped with certainly aided the level of pleasure of the ride. A quality blend of accurate road feedback and damped sensations allowed me to focus on the ride, rather than distractions that would come from a less comfortable bike. If anything, the front end was a bit harsher than the rear, but neither would have you hurting by the end of a long day — except if that day comprised all dirt or rough roads. Likewise, handling was a real pleasure. In the drops, even on loose surfaces, the bike tracked confidently, with balance and predictability. Not twitchy, not loose, not languid. Refined. Its ability as a climbing and sprinting machine, or generally just mashing out of the saddle, was slightly less impressive. Its weight may hold it back marginally so on longer climbs. Acceleration out of corners was good but not exceptional. Could you tell that the bike was meant to slice through the wind? Not exactly, but with the deep wheels and smooth-rolling rubber, it did feel quite sprightly. The rim-brake version is designed for single-bolt brake calipers while the flat-mount disc-brake version has 12-millimeter thru-axles. All cables are internally routed, and thanks to interchangeable fittings, the Tere is compatible with both mechanical and electronic group sets. Notable is the fact that the geometry of the rim- and disc-brake versions of the Tere are not identical. The chain stays of the disc-equipped bike are three millimeters longer, increasing the maximum tire width from 25 to 28 millimeters. Simultaneously, the front-center is also three millimeters longer, slowing the steering for any of the more adventurous riding you do. 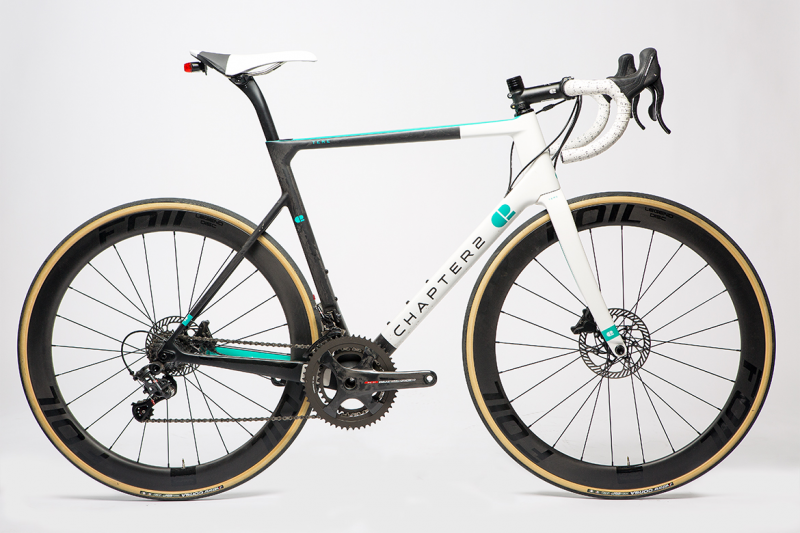 The Limited Edition White & Aqua paint scheme of our test bike is one of several unique, gorgeous finishes that are produced in limited quantities and change every six to eight months and. Once sold out, it will never be produced again. You get a look that will stand apart.